Potential AFC Wimbledon stars of the future were given inspiration from one of the leading coaches in world sport with Eddie Jones popping along to watch a training session. Watch the video of Eddie Jones' visit to AFC Wimbledon with Coerver co-founder Alf Galustian here. The England Rugby Union Head Coach was joined by national Forwards Coach Steve Borthwick to observe Dons academy players being put through their paces by Coerver Coaching co-founder Alf Galustian. 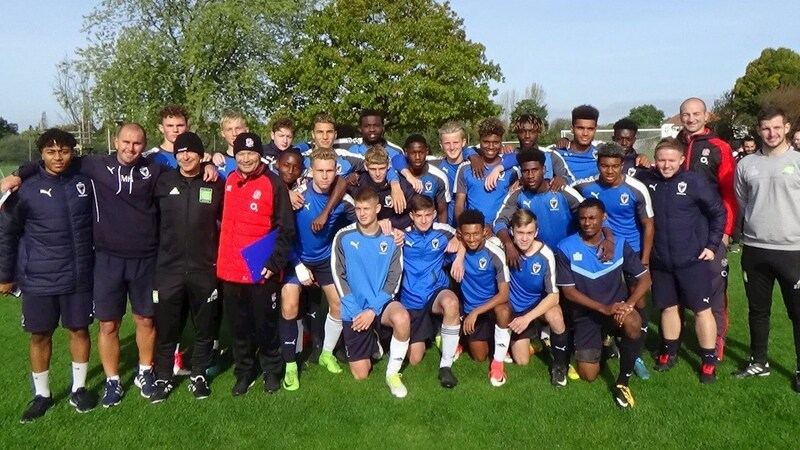 In an uplifting speech to AFC Wimbledon's young talents at the training ground, Eddie Jones offered them advice on making the grade as they seek to forge professional football careers. Eddie talked about Owen Farrell's dedication to being one of the best kickers in the world and about his visit to one of the leading football clubs in Europe. "The best football session I have seen by a mile was Bayern Munich with Pep Guardiola. The thing that stood out for me was that these are some of the best football players in the world, but every ball they contested was 100 per cent and every pass counted. They did a warm-up and the 'El Rondo' training drill. They were not just warming up, they were playing to win. Then they played a 7 v 7 ball game, showing so much energy in their work off the ball and communicating with each other. "The big difference with players is that it's not about how big you are or who your mother of father is, it is your attitude and how much you want it. Out of the guys here today, I could pick two or three who are going to make it. They were talking all the time, helping themselves get better, and also helping others to get better. Every time you come to training you have to think, 'how can I get better and how can I help my team-mates get better?' If you have that approach you will have a great career. What you want to do is give yourselves the best chance to be the best that you can be. It was good to see you today working hard, but I reckon all of you can train harder. "Alf is a master coach. He has an ability to develop fundamental skills and then put them into a game context, I've not met anyone like him. It was a great opportunity for me and Steve today and we've got good ideas that we are going to take back to England training with us. We are all really appreciative to Wimbledon for putting on the session, the boys were fantastic. You are a club aspiring to be better with good young players and great young coaches, who are willing to learn. They want to learn from Alf, they want to learn how to do things differently, and it is a great environment you have here." Alf Galustian put on eight training drills lasting just over an hour, offering a different kind of training session to what the Dons youngsters usually experience on a Thursday. He explained how Eddie's visit to AFC Wimbledon came about. "I have a connection with Wimbledon because I started here as a young player," said Alf. "When I'm back in England I try to come and help here. Eddie is my friend. I met Eddie and Steve when they were in Japan. I've had a long association with Japan. Over 35 years ago I co-founded a method called Coerver Coaching and Eddie thought it was decent. When we were in Japan we talked about one day trying to convert some of these footballing philosophies, including drills and games, into rugby development. Mark Robinson is one of the best academy coaches I have come across and it's great to do this at AFC Wimbledon." AFC Wimbledon's Academy Head of Football Mark Robinson said: "Alf does two or three sessions a year with the academy, which is fantastic for us because he works with the biggest clubs in Europe. He just contacted me and said that Eddie and Steve were looking to come to a session and look into how rugby and football can carry over. Eddie is renowned as someone who looks at different sports to continue his learning, which shows why he is so good. Alf said he would like to come down to Wimbledon. Obviously, it was a no-brainer for us. It was absolutely fantastic for the boys and our coaches for Eddie to come down."